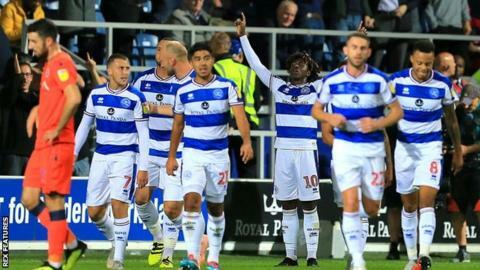 QPR extended their unbeaten run to four Championship games as two goals in three first-half minutes gave them victory over London rivals Millwall. Massimo Luongo gave the R's the lead on the half-hour mark at Loftus Road as he nodded in Nahki Wells' deflected shot in front of Lions keeper Ben Amos. Rangers doubled their lead two minutes later when Ebere Eze's half-volley from Jake Bidwell's left-wing cross bounced in off Millwall centre-back Murray Wallace, while the visitors failed to test Hoops keeper Joe Lumley in the first half. Substitute Steve Morison's angled effort was palmed away by Lumley after the break and Jake Cooper rattled the bar with a header from a corner, but the Lions slumped to their fourth defeat in five league games. Striker Tom Bradshaw made his first start since joining Millwall from Barnsley but was replaced by Morison at half-time, while Rangers' Israeli frontman Tomer Hemed was dropped to the bench after fasting during the Jewish holy day of Yom Kippur. Amos kept the score at 2-0 in the second half, getting down to his right to push away a low drive from Wells before saving Luke Freeman's follow-up with his feet. Rangers had lost their first four league games but Steve McClaren's side continued to threaten, as Amos saved an effort from Luongo and pushed a free-kick from substitute Hemed behind for a corner. Neil Harris' Millwall side finished eighth last season, three points off the play-offs, but are just a point above the bottom three in the table following a run of five games without a win. "It was fantastic in the first half. Great football, good organisation, we defended well and composure was the key. "We deserved more goals but I am delighted with a clean sheet. Toni Leistner and Joel Lynch have worked so hard on the training ground to form a partnership. "We have got a good blend and balance of youth and experience which we didn't have four or five weeks ago." "It was an improved second half performance because it couldn't get any worse than the first half. I take full responsibility for team selection and tactics. "I picked a team to perform better than that. If I could have changed 11 [at half-time] I would have done. "It is all about playing the derby and playing the atmosphere but in the first half my players didn't turn up. I won't accept that ever again." Match ends, Queens Park Rangers 2, Millwall 0. Second Half ends, Queens Park Rangers 2, Millwall 0. Attempt blocked. Lee Gregory (Millwall) right footed shot from the centre of the box is blocked. Assisted by Tom Elliott with a headed pass. Attempt missed. Tom Elliott (Millwall) header from the centre of the box is close, but misses the top left corner. Assisted by Conor McLaughlin with a cross following a corner. Corner, Millwall. Conceded by Angel Rangel. Attempt saved. Jed Wallace (Millwall) right footed shot from the right side of the box is saved in the centre of the goal. Assisted by Steve Morison. Attempt missed. Jed Wallace (Millwall) right footed shot from outside the box is too high. Assisted by Steve Morison. Attempt missed. Tom Elliott (Millwall) header from the centre of the box is just a bit too high. Assisted by Conor McLaughlin with a cross. Attempt saved. Tomer Hemed (Queens Park Rangers) left footed shot from the centre of the box is saved in the centre of the goal. Assisted by Joel Lynch. Eberechi Eze (Queens Park Rangers) is shown the yellow card. Eberechi Eze (Queens Park Rangers) has gone down, but that's a dive. Corner, Queens Park Rangers. Conceded by Ben Amos. Attempt saved. Tomer Hemed (Queens Park Rangers) right footed shot from outside the box is saved in the top right corner. Jiri Skalak (Millwall) is shown the yellow card for a bad foul. Foul by Jiri Skalak (Millwall). Substitution, Millwall. Tom Elliott replaces James Meredith. Attempt saved. Massimo Luongo (Queens Park Rangers) left footed shot from the centre of the box is saved in the centre of the goal. Attempt blocked. Shaun Williams (Millwall) right footed shot from outside the box is blocked. Foul by James Meredith (Millwall). Substitution, Millwall. Jiri Skalak replaces Aiden O'Brien. Attempt missed. Joel Lynch (Queens Park Rangers) header from the centre of the box is just a bit too high. Assisted by Jake Bidwell following a set piece situation.